Writer of fiction, soldier of fortune, climber of rocks, inveterate liar. All true. Except the last one. And the second one. And he doesn't climb much these days. OK, seriously now. Tom lives in Oxford, where he enjoys the refreshing and perpetual rain. When not writing fiction he works as an ecologist at Oxford University's Zoology Department. Over the years he has met quite a lot of wildlife. Most of it tried to bite him. He loves hiking up mountains, walking through woods, climbing on rocks and generally being weather-beaten outdoors. Pouring words into books makes Tom very happy. Go on and check them out. 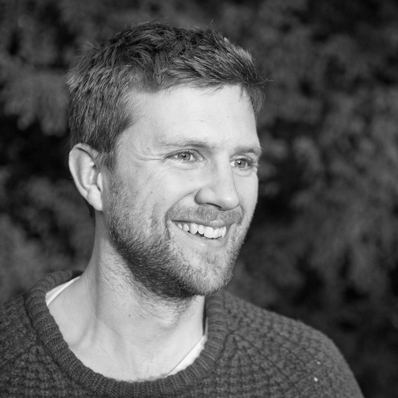 Or find out more about Tom through a short Q&A session instead. Q: Is there a particular book, author, or film that had a particular impact on you in your childhood? A: As a child (a phrase which, incidentally, makes a completely false distinction between how I acted when I was under 14 and how I act now) I devoured - not literally - just about any fantasy book going. It started with The Faraway Tree books and quickly progressed up the credibility spectrum to The Dark is Rising. I'm still unsure whether the Enid Blyton was entirely healthy, but it was all part of the amazing and constant literary diet supplied by my mother. Later on it was Ursula le Guin and David Eddings...and then I discovered Terry Pratchett, beginning a one-sided love affair that Sir Terry is thankfully still unaware of. Oh, and I loved the film The Dark Crystal. I recently found a copy and re-watched it. Great stuff. Q: What did you enjoy most at school? A: Easy: English, Art and Biology. I still do two out of three. Q: What is your earliest memory? A: Hang on....I'm sure I used to know this one. Q: Is there anything you’d like to tell us about your pets, past or present? A: We had a dog called Sadie. Sadie buried disreputable objects in flowerbeds. She chased our neighbour's cat down the garden, receiving such a bad clawing that we had to put her in a bath of diluted disinfectant. She could look more comfortable in an armchair than anyone, person or animal, I have met since. In winter she would hog the fire and nearly pass out with the heat; and even then she had to be told to go and lie somewhere else. She regularly moulted enough hair to mitigate several oil slicks. She once climbed onto the dining table and ate the contents of the margarine tub and sugar bowl. She would roll in anything as long as it smelt bad enough. One summer we took her to the beach where she spent a happy hour drinking seawater. Then she spent an extremely unhappy night having rampant diarrhoea on my grandparents' rug. She once dived into the river and only discovered it was frozen when she hit the ice. She chased anything that went away from her fast enough. This included several cars, many rabbits and, sometimes, joggers. She caught one of each. (We apologised to the jogger, who got slobbered on.) When any of us came home she would hit us at a flat trajectory out of the door: a huge, grinning bundle of energetic, squeaking enthusiasm. She used to sleep in my bedroom and once managed to get into bed with me during the night. I woke up in the morning to find her head on the pillow next to mine. She did not have good morning breath. One Christmas, as we all sat down to dinner, she ate Auntie Mary's present, which was a large box of chocolates, and threw it up under the table. In short, Sadie was a proper dog. It was an honour to have known her. Q: What is the most unusual job you have done? A: I'm an ecologist and now, excitingly, I seem to be writing novels. These are both the most unusual jobs I have done, and prove this on a daily basis. A: My ability to rise above material concerns. Yeah, right. Q: Can you list three things we don’t know about you? I can raise my big toes without moving the other toes. I can move my little toes without moving the others. I have a scar on my right foot from when I trod on a needle and it snapped off inside. It was in there for two months and took an operation to remove it. So there, that's three, and I'm not even past the feet! Q: Do you have any hobbies. A: Oh, lots! I always loved walking and still do. Most of the others seem to involve getting injured. I used to fence (with swords, not with bits of wood, wire and little 'U' shaped pins) but broke myself. I used to rock climb but...erm...broke myself again. I tried snowboarding once and broke my wrist. I now do archery, which is great - I nearly broke myself, but didn't. Q: When did you first start to write stories? A: I'm one of those irritating, smug people who always thought they would get around to writing. I remember when I was 10 and at Primary School I wrote a piece that the teacher (Mr. Dixon) read out in class, saying it could have been taken from a novel. I thought "Wow. Really?" and then became an ecologist and forgot about writing - except for an aborted attempt at a fantasy book when I was 22 and some very silly Christmas plays that I sometimes wrote with my friends*. In 2003 a friend persuaded me to write a science journalism piece for a New Scientist science writing competition (naturally about water voles). I was utterly stunned when someone phoned up four months later and told me I'd won it. The article was published, I felt good, and then I forgot about writing again (I had voles to study). But I started writing properly - meaning just for me, with a view to being good at it – about seven years ago. I borrowed my house-mate's laptop and wrote a short story about a possessed snowman (no, really). I was ridiculously happy with it and entered it for a major competition...and it utterly failed to get anywhere. I suspect that it wasn't very good. Anyway, I settled down and wrote a lot more stories and then, a year or so later, I wrote a piece about a teddy bear in a graveyard. That story won the 2008 JBWB spring short story competition and gave me a real boost. By then I was already hooked, but that story seemed to change something in my head: a kind of "Ooh, I might be good at this" feeling. Q: Did you enjoy writing The River Singers? A: Yes, I absolutely loved it. Initially I some sort of weird, internal prejudice against writing "a book about animals". But I quickly realised that there’s no such thing: a story is a story and it doesn't matter whether characters are animals, humans or anything. The fact that they happen to be animals, of course, dictates the details of the world that they find themselves in. But stories unfold a certain way and characters think and feel and react to them; readers relate to the characters and as long as there's a level of connection and understanding then hopefully everything works and it's fun to read. And writing about water voles is great because the problems they face tend to be life-threatening. Their world is an odd mixture of beautiful, extremely dangerous, very familiar and quite alien. It lets me place my characters in strange and difficult situations and then look to see what sort of people they are. Once I'd grasped the above points I felt like a complete twit for ever having been reluctant to start. In short, ever since I started writing I haven't been able to stop. Despite numerous requests. Adventurous, exciting, and bursting with charming illustrations - this is a book you'll want to treasure for ever. 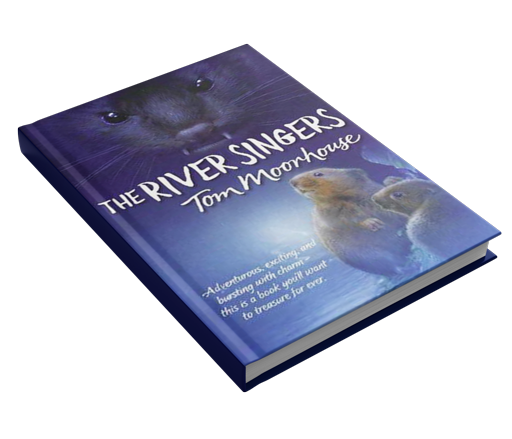 The River Singers is Tom's first published novel. More books will follow. The River Singers is a compassionate celebration of nature and a gripping story. 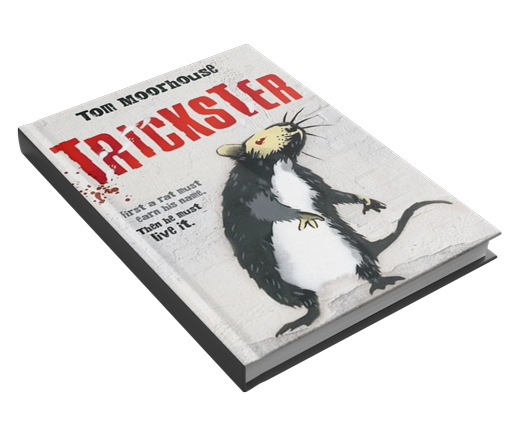 It's uplifting and sad and Moorhouse takes you right into a world of creatures "as sweet as apples and as brief as day”. — Martin Chilton, The Telegraph. When their uncle Sylvan pays an unexpected visit, young water voles Kale and Strife know something exciting must be about to happen. Little do they know that soon they'll be running for their lives, as a new danger threatens to destroy everything and everyone they care about. This thrilling follow-up to the highly-acclaimed novel, The River Singers, will transport readers into a vivid world of riverbank creatures, where excitement and danger are never far away. Contains beautiful black and white illustrations by Simon Mendez. First a rat must earn his name. Then he must live up to it. 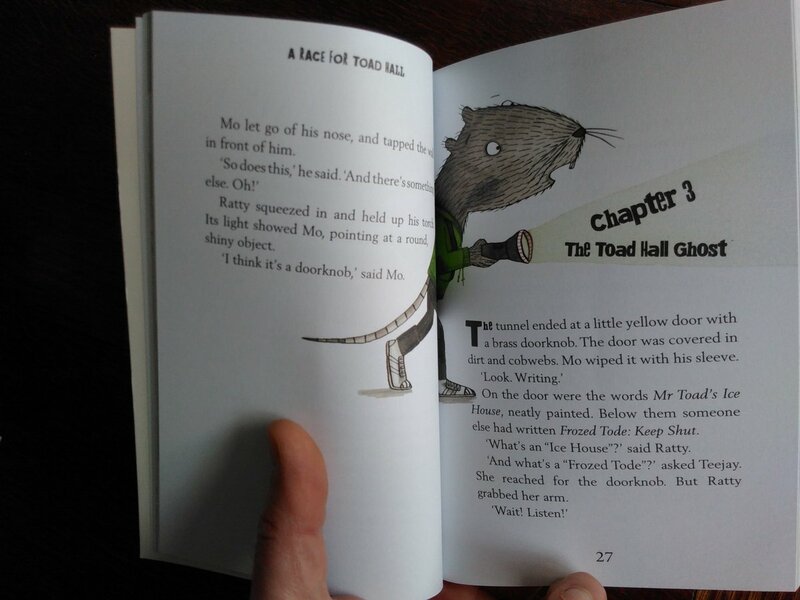 This is the story of Gabble, a young rat with a wild, beloved, but unpredictable brother, Ash. When Ash tricks Gabble into going with him on a 'name raid', a dangerous mission to earn a True Name, Gabble finds himself drawn into a perilous adventure, crossing boundaries, fighting with enemies and eventually being forced to confront both his brother and himself. 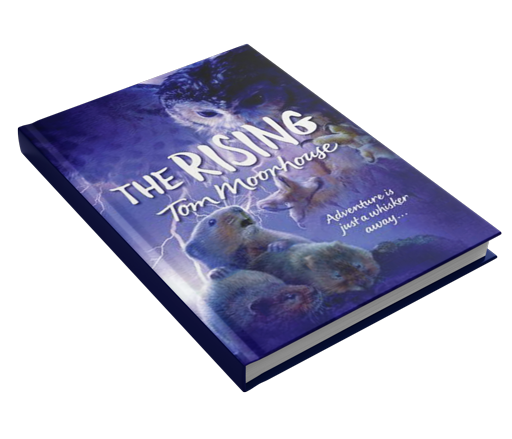 A thrilling adventure from Tom Moorhouse. Stand-alone story, but for fans of The River Singers and The Rising, there is the extra dimension that this is the story of the young Fodur the rat from those stories. Coming soon...A Race for Toad Hall! So this arrived today through my letterbox, prompting a lot of author excitement! And it is what you think it is. It is indeed a brand new book featuring everyone's favourite (non-very) lean, definitely green, amphibian car driving machine. 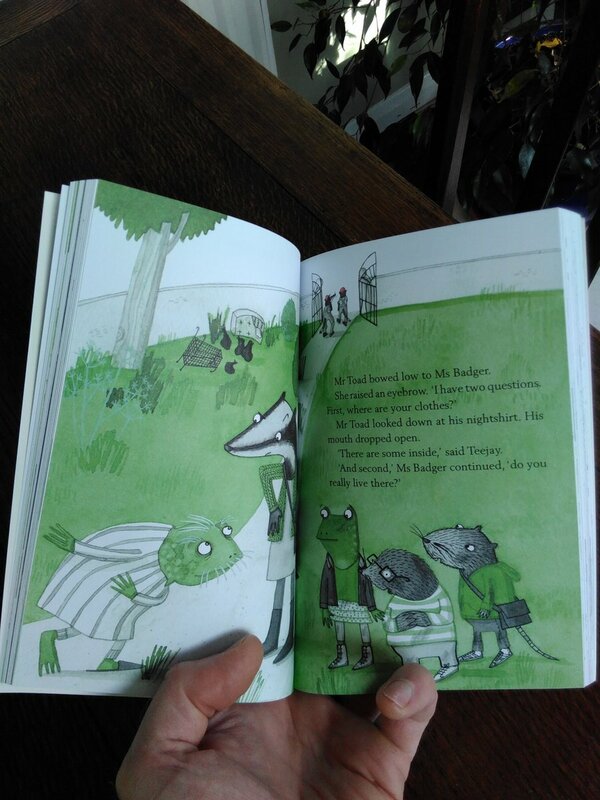 It's the first book of a new series of adventures featuring Mr Toad. It comes out in March, and I can't wait! By the way, this is aa secret. It's an ultra-exclusive sneak peek. Tell nobody. He's back: defrosted and dangerous. The Cameroon Books project is GO! You know the ones: those seemingly innocuous conversations that turn out to be something much bigger than you could ever have anticipated? Well that's the conversation I had in early 2013 with my friend Christos when he asked me to write up a bunch of stories he had collected from his conservation project's study site in Cameroon. His plan was that I'd write the stories up in good English, he'd photocopy them and hand them to the local kids to read. To learn more about our project, and get hold of the AMAZ...um, beautiful book we're creating, please CLICK RIGHT HERE and be a part of our project! Thank you!